This component can be used to select multiple documents in a hierarki. When the component is inserted on a page a small textbox with a browse button is displayed. When the user clicks the browse button a client side dialog box shows up from which the user can select a document from the hierarchy. docstitle Visble, show the name of the selected document. docsid Hidden, contains the identifier of the selected document. This component is typically used when there is a need for an user to view and select documents from a hierarchy of documents. Optional parent id. Leave empty to use current id as parent. DisplayText: variable name A string describing that is displayed, eg "Selected categories:"
Attributes: variable name Custom html-attributes in textbox. A fieldname to use for the textbox . Optional, an identifier of a document that should act as the root of the hierarchy. Leave empty to use current id as root. The text of the browse button. Optional, a string describing that is displayed, ex. 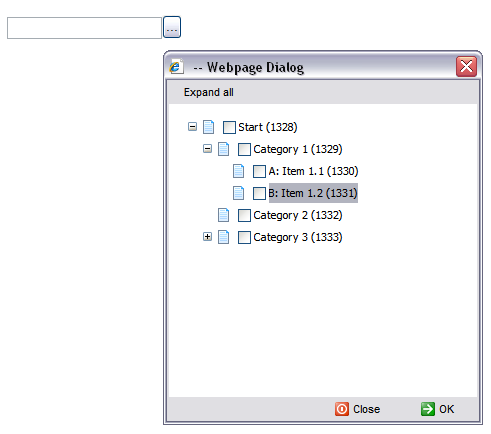 "Selected categories:"
Optional, the html-attributes to be applied in the textbox.